The value of the Muffle effect is set to 1, so the Ebony Mail alone completely eliminates all noise from your armor. However, the Muffle effect for the Ebony Mail only activates while you are in sneak mode. 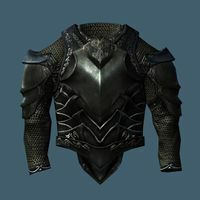 The Ebony Mail armor is the lightest heavy armor cuirass and has the best defense-to-weight ratio (1.61) in the game. Three materials have a better basic armor rating, daedric, dragonplate, and stalhrimDB, but are all much heavier. Dragonplate and stalhrim have only one point of armor rating more, while daedric has three, while they are 14, 12, and 22 points heavier, respectively. Choosing Ebony Mail over the other sets is a small loss of defense (which has a maximum limit achievable without the best armor), in exchange for a relatively large amount of carrying space. Getting too close to any non-allied NPC can trigger the poison aura, effectively attacking the NPC. This effect also can cause pickpocketing and sneaking to fail where it would normally succeed. - The poison aura is however quite useful when swimming as it can kill slaughterfish. The smoke emitted by the poison cloak can obscure a significant part of the screen in first-person view and thus interfere with your ability to see enemies while in combat; the effect is especially noticeable when you are stationary or aiming a bow. Brawling while wearing the Ebony Mail violates the rules of a brawl and will give you an assault bounty. This issue has been addressed by version 1.2.4 of the Unofficial Skyrim Patch; the poison cloak enchantment will no longer cause unintended damage during brawls. Because of all these drawbacks, you may want to consider giving the Ebony Mail to your follower. Followers do not benefit from Fortify Carry Weight enchantments, the Steed Stone, or the Conditioning perk; Ebony Mail is an excellent choice to mitigate this limitation (see second note). The problems that the poison cloak causes regarding sneaking and pickpocketing can be easily worked around by having your follower wait a safe distance away. Followers do not get involved in a brawl, so they will not assault your opponent with the poison cloak. The Ebony Mail can be used as a radar: it will activate the smoke effect as soon as a creature or NPC goes hostile. The Champion of Boethiah will re-equip this armor every time he is revived with Dead Thrall, which can be exploited for infinite gold and powerful armor for your followers. Prior to the last official patch, the Ebony Mail, like all ebony armor, was not considered heavy armor for the purposes of the Matching Set perk. During the quest Diplomatic Immunity, the armor has a tendency to be absent from the chest with the smuggled items. Avoid giving Malborn the armor. ? This page was last modified on 28 February 2019, at 08:49.